The saying goes: "One person's trash is another person's treasure." This couldn't be more true when it comes to dandelions. Many gardeners describe this hardy and bright yellow plant as the scourge of their gardens. It is a weed that takes over entire fields and makes its home in the heart of many flowerbeds. The plant seeds are spread each summer though the distinctive starburst firework-like nature of the seeds. Blowing on the delicate stems is a favorite summer pastime — as long as those seeds don't land in the neighbor's perfectly groomed garden. On the other hand, dandelions are beloved by naturalists across the globe. They are easy to grow just about anywhere and they are healthy beyond measure. Dandelions have been used since the early 10th century as medicinal herbs. It was used by the Chinese to treat stomach problems and is a staple in traditional medicine for bone health. Find out more about the dandelion plant and see how you can reap health benefits by brewing your own dandelion tea at home. You can make dandelion tea from the leaves, flowers, or roots of the plants, with the latter being the most common method. Herbal tea made with the flowers tends to be more delicate and sweet than those made with the roots or leaves. Dandelion leaves are generally harvested in the spring while the roots and flowers for tea are removed in the fall. Dandelion tea can also be found in tea bags at your local tea shop. The dandelion plant is known by the botanical name Taraxacum officinale. This plant is often used to make dandelion tea and dandelion wine as well as dandelion jelly and jams. These plants derive their name from the French phrase "dent-de-lion," which translates to lion's tooth. 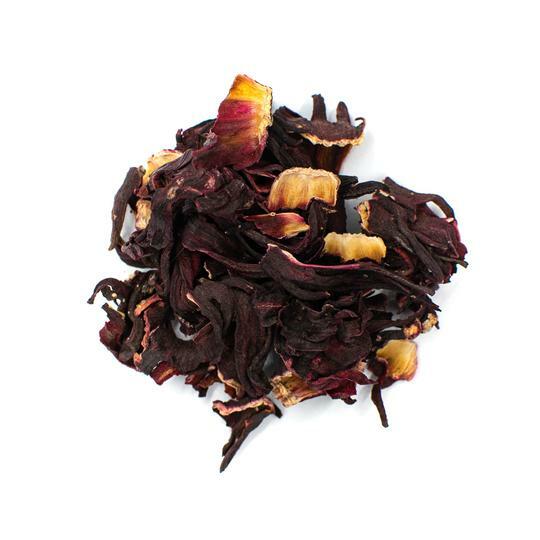 Dandelion tea is generally delicate and lightly sweet in flavor. Roasted dandelion teas like dandelion coffee tend to have a stronger, toasty flavor and a deeper aroma. The dandelion plant is not overpowering so it can be combined with bold flavors such as masala chai and black tea leaves. It is often sweeten or flavored using citrus fruits and other garden greens. Dandelions are packed with nutrients and antioxidants that can boost your health. Ever part of the plant from dandelion roots and dandelion leaves to the vibrant dandelion flowers is edible. Dandelions contain antioxidants such as beta-carotene that help prevent cell damage. The leaves and flowers also contain vitamin C, which helps to boost the immune system and ward of the common cold. Dandelions are a good source of fiber that streamlines digestion. The leaves of the dandelion plant contain more protein than spinach, making it a good choice post-workout. Dandelion roots are often used to make tea and boast significant health benefits of their own. They contain high levels of potassium, calcium, and phosphorous. All of these nutrients promote bone and tooth health. Magnesium in dandelion roots helps to relax muscles and alleviate pain. 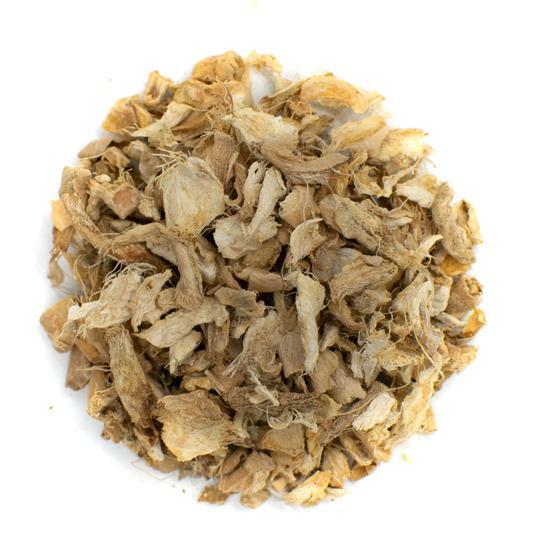 Dandelion root also works as a diuretic and detoxifier, purifying the entire body. The roots are also chock full of antioxidants. These antioxidants work to eliminate free radicals in the body that can cause premature aging and cancer. Many of the antioxidants found in dandelion roots can help to inhibit the growth of and induce death in cancer cells. Dandelion coffee is also known as roasted dandelion tea. The production and brewing methods result in a tea that tastes similar to coffee. The dandelion plant doesn't contain any naturally occurring caffeine so it won't replace that jolt you get from a cup of joe. However, it is a great alternative if you enjoy the taste of coffee, but are trying to cut back on your caffeine intake. It is also an ideal coffee substitute for people who like a roasted coffee flavor, but are sensitive to caffeine. The dandelion plant features long, wiry taproots that are often twisted and deeply embedded in the earth. Use a large spade or a dandelion fork to remove as much of the roots as possible. Separate the root from the leaves and stems. Rinse well using cool water at high pressure. 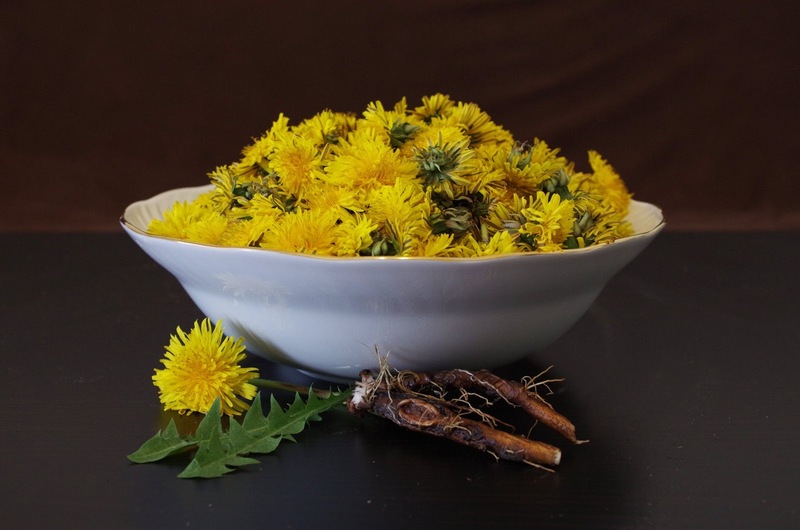 You can save the leaves for use in salads and keep the flowers for dandelion flower teas. Cut the fresh roots into smaller pieces using a mandolin or sharp knife. Preheat the oven to 200 F and place the dandelion roots on a baking pan lined with parchment paper. Leave the dandelion roots to roast for 2 to 3 hours depending on thickness. Rotate the roots often to avoid burning. The roots are done when you can snap them in half easily and cleanly. If the roots bend and are flexible when trying to break, they need more time roasting. You can also roast the dandelion roots in a pan on medium high heat. Cast iron pans work best for imparting the smoky, rich flavor of roasted dandelions. Stir often and make sure to avoid burning the roots. The dandelion roots will be ready for tea brewing when they turn dark brown. You can grind the dried roots into a fine powder using your coffee grinder if preferred. Otherwise, you can simply use the small dried root pieces you roasted earlier. Use a small saucepan to bring water to a boil. Add the dandelion root to the boiling water and simmer for 20 minutes. Strain the roasted roots out using a fine mesh strainer. Serve as-is or add sweetener and milk to taste. 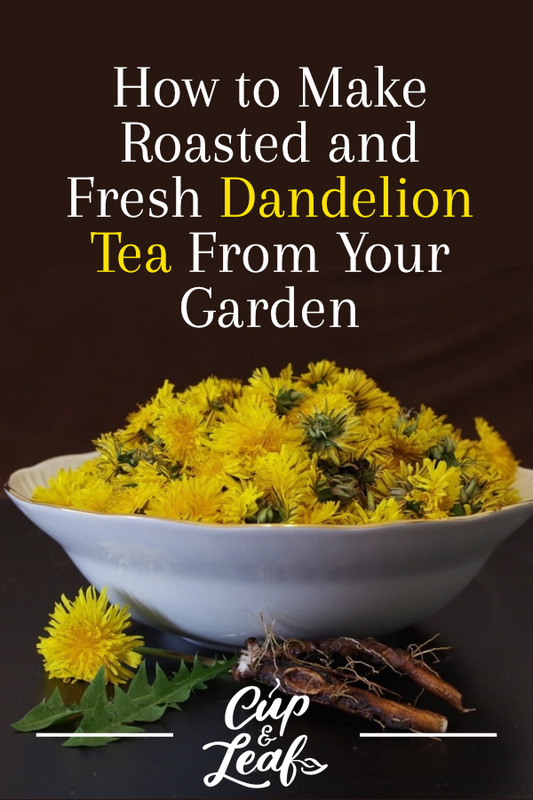 You can make a quick cup of dandelion tea from the leaves in your own garden. Harvest six leaves from the dandelion plant. Choose only the leaves that are young and tender. You'll end up with bitter leaves and bitter tea if you use more mature dandelion leaves. Rinse the leaves well under running water and pat dry with a towel. Cut the leaves into small pieces or grind gently with a muddler to release flavor and healthy compounds. Add the leaves to your tea cup. Bring water to a rolling boil and pour into your cup. Steep the dandelion tea for 5 to 10 minutes. Taste every 30 seconds after the first 5 minutes to ensure flavor your enjoy. You can drink your dandelion leaf tea as-is or sweeten it using coconut oil, honey, or brown sugar. Keep the sweeteners to a minimum to preserve the healthy nature of this tea and avoid turning it into a calorie-dense beverage. You can also flavor your dandelion tea naturally by adding a slice of lemon or orange. Dandelion flowers make for a delicious iced tea beverage that can help you cool down in summer. Combined with a little lime, this weed tea is just what you need this summer by the pool. Gather about a quart of fresh dandelions from your garden. Remove all the stems and leaves and place the yellow flowers in a colander. Rinse well using cool water. Add 1 cup of hot water to a large bowl. Add the dandelion flowers and steep for 5 to 8 minutes. Transfer the dandelion tea into a large glass pitcher. Add the juice of 3 to 4 limes for a tangy taste. Place the dandelion tea in the refrigerator and cool for a few hours. You can serve the dandelion tea with the flowers in the glass or strain them out if preferred. Dandelion tea can be saved for up to 36 hours. Add a stevia leaf — leaves from the plant used to make the famous sweetener — for a light and natural sweetener. Make sure to add the leaf to the hot water and let it steep with the dandelion flowers. You don't have to get on your hands and knees in the garden every time you want to make dandelion tea. You can harvest the flowers, leaves and roots each spring or fall and store for later use by drying the plant parts. There are several ways to dry dandelions for tea. You can simply leave the dandelions out in the sun to dry them and prevent oxidation. Alternatively, you can place them in the oven and roast them. Set the oven to 250 F and roast for 2 to 3 hours. Once your dandelion plants have been dried, store them in an airtight glass jar. Keep the jar in a cabinet or cupboard out of direct sunlight. Make sure to store your dried dandelions in a cool, dry place to avoid bacteria growth. The Food and Drug Administration or FDA has recognized dandelion greens as generally safe for consumption. Dandelion tea has few side effects when consumed in moderate amounts. Only harvest dandelions that have been grown organically when brewing your own tea. Dandelions found alongside busy roadways or those that are cultivated using pesticides can have additional negative side effects. Dandelion tea can cause allergic reactions in people with plant or flower sensitivities. These plants can trigger allergic reactions in people who have allergies to ragweed, daisies, marigolds, and chrysanthemums. Avoid drinking dandelion tea if you have allergies to these or related plants. Stop drinking dandelion tea if you experience symptoms such as hives, difficulty breathing, or swelling of your face or throat. Dandelions have been used in Chinese medicine to promote lactation. However, research hasn't demonstrate whether dandelion tea is safe for women who are pregnant or breastfeeding. Consult with your physician before drinking dandelion tea. Dandelion tea can interact with other prescription drugs and over-the-counter medications. Don't drink dandelion tea if you are taking medications such a Cipro and Levaquin for bacterial infections. Dandelion tea can interfere with blood thinner medications. You should also avoid drinking dandelion tea if you are taking diuretics or heart and blood pressure medication. Even though dandelions are considered weeds, they are potent plants that offer an array of health benefits. Dandelion tea is an excellent digestive aid that you can brew from plants in your garden. The prebiotic nature of these plants makes them a great addition prior to and during meals. The antioxidants can help you stay healthy and happy all year long. Brew your dandelion tea using roots, flowers, or leaves. You can forage for dandelions in the woods or pluck them right in your own garden. There's no shortage of these weedy, yet vibrant plants. Make sure to harvest away from heavily trafficked areas and grow your dandelions without the use of pesticides. Say hello to new flavors and try dandelion tea different ways to discover your favorite blend. 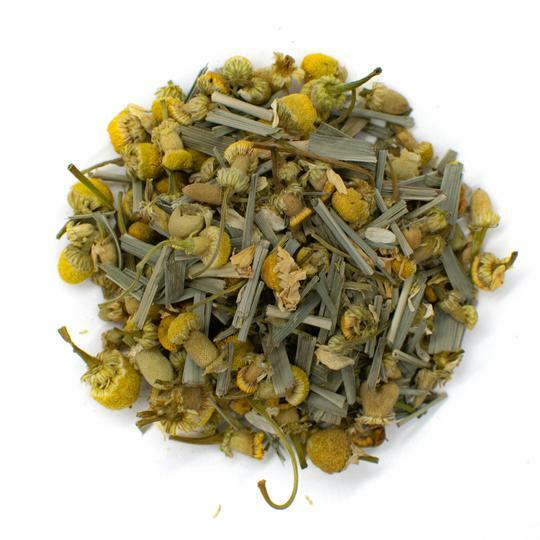 Put a new spin on your daily cuppa with dandelion weed tea.